Me being me, I made some changes to this recipe. I added some tomato and garlic, replaced the soy cheese with wholegrain mustard, and sprinkled savoury yeast over the top. 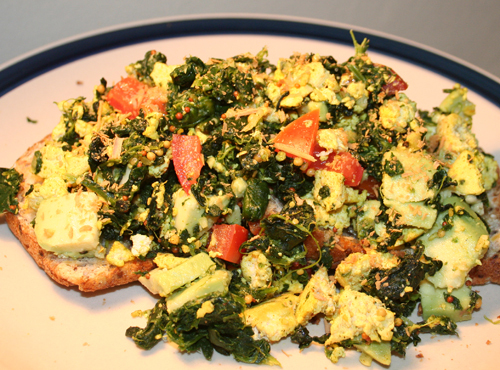 Definitely the best tofu scramble I have made so far! I used the recipe above for the cheezy sauce, but a plain grilled cheeze sandwich is so boring! 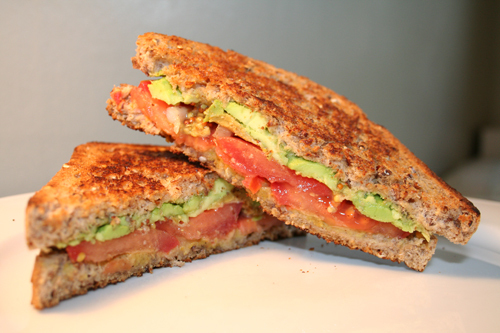 I added tomato, shallots, avocado and mustard – heavenly! That’s it for pictures for now. As my holiday continues, prepare for more kitchen carnage and holiday breakfasts! I found this website called Vegan Eating Out that I found an interesting read. It’s mainly American based but the information about fast food chains that have made it to NZ and what vegan options they have is a handy resource to have. Fast food is mostly just gross BUT (good) vege burgers are one of my favourite foods, and I’m the first to admit that when I’m drinking or hungover I crave the Burger King’s vege burger with a vengeance. So I was thrilled to read that the bun, onion rings, fries and of course salad available at BK are technically vegan (just not very realistic) – which means that at 3am after a few drinks, or a few hours later when the headache has kicked in, I can still go get my favourite cure – minus the cheese and mayonnaise. What the website information doesn’t factor in is idiotic or simply uncaring staff. I decided to test out the veganisation of BK fare last week after the final exam of my university career. We were finished, we were celebrating/drowning our sorrows in the pub for a few hours, and then realised it might be time for lunch… *ahem*… so I headed over the road to BK, feeling very self righteous and smugly vegan alongside the usual dirty feeling that accompanies such food places. I asked for my burger, hold the cheese, hold the mayo, swaggered back across the road with it, opened it up… and found that those particular BK employees are only capable of retaining one piece of information at a time. Despite me repeating and confirming my order, and the cashier repeating it yet again as she handed over my food, they had managed to hold the mayo but still added the cheese. I wasn’t too impressed. I was also drinking and too lazy to complain. I added some processed cheese to my list of sins and regressions. I know it’s a bit much to expect, really, of a place like BK. The staff are paid minimum wage, they don’t have the coolest or most fulfilling job in the world, they’re probably busy and people like me make their lives difficult. But I also deserve to have the food I order, and food that doesn’t include things I can’t and won’t eat. Of course I should be going to Handmade Burgers and Burger Fuel and those awesome burger places with gourmet menus and multiple vegan options to choose from – they are delicious and I love them. They are also more expensive and more filling, which 9 times out of 10 is a great thing, but sometimes I just feel like eating crap. And as an attempted vegan, I have the right to ask for and get vegan crap.